The story of Eton Wick Baby Clinic has been researched from the pages of the parish magazine and told by village resident, Joan Ballhatchet. On Friday 19th February, 1915, one of the first baby clinics in Buckinghamshire was opened in Eton Wick Village Hall. It was known as the Babies' Welcome. It was started by Nurse Orchard who was the certified midwife provided by the Eton Wick Nursing Association, which was run by a committee of ladies, including masters' wives from Eton. College, and funded by donations and subscriptions. The work of the Association in Eton Wick as well as in the town of Eton, was at that time (1915) part of the Church of England's ministry to the working class. By 1917 the Babies' Welcome was well established, meeting twice a month. The Eton doctor attended the first meeting of each month and would give a free consultation to any mother who wished to ask his advice concerning herself or her children. The nurse had many willing helpers. She was assisted by two ladies from Eton College, who did all the organising and kept the records, and two mothers from the village whose children had already started school. The babies were weighed and advice was given (not merely offered) as to their diet and care. Short talks were arranged on many subjects of interest in the home: on the feeding of infants, children and invalids; on first aid; and on the treatment of children's ailments. At first the talks were given by the doctor, Nurse Orchard or one of the ladies from Eton College, but later, when the Welcome became affiliated to the Buckinghamshire County Association of Infant Welfares and received an annual grant from the county, then the Medical Officer of Health, Dr Holden, and the County Organiser, Miss Turnbull, visited the meeting about twice a year to speak to the mothers. The talks by the Eton College masters' wives, however, continued and sometimes a college master would 'give a lecture'. In 1925 there was also a lecture by the National Milk Publicity Council. Mothers were able to buy milk foods and Virol (a proprietary brand of malt extract) at wholesale prices. Materials for garments and wool for knitting could be obtained in a good quality at reduced prices. Patterns were provided and garments cut out for those who needed them. At some meetings there would be dripping for sale; this was brought from the kitchens at the Eton College boys' houses on the morning of the Welcome to a helper's home where it was cut and weighted into 4 oz, pieces and wrapped in greaseproof paper. A sale of second hand clothes took place at the Welcome periodically, the proceeds of which went to the Welcome funds. There was a social atmosphere to the afternoon too, as mothers enjoyed a cup of tea and chat with their friends while the toddlers played. These descriptions in the parish magazine, of a village activity by women for women, provide a valuable insight into an area of the life of mothers and children that has previously received little attention. Considered in a wider context, the account of the Babies' Welcome adds significantly to what is known of the improving health of the nation's children at this time. Although adult death rates had begun to decline in the late nineteenth century, infant mortality figures did not begin their decline until the twentieth century. In 1840 the rate of infant death had been 153 per 1,000 live births; in 1896 -1900 it was 156, but by 1905 -1910 it had fallen to 117 per 1,000 and it continued to fall. There has been much debate as to the relative importance of the contributory causes, but undoubtedly improved nutrition, better housing and sanitation, supply of water and gas, the manufacture of good powdered milk feeds, vaccination and the first cheap antibacterial drugs all played their part. Here though is something else: access to medical and maternity care for women and the education of mothers in child care in a pleasant social atmosphere. The educational standard of the Babies' Welcome at Eton Wick must have been high and its influence extended beyond the mother and baby to include the whole family. Mothers were encouraged to enter the National Mothercraft competitions held each year in conjunction with Baby Week at which time the Bucks County Infant Welfare Association also sponsored competitions for knitting and sewing. Papers were set on such subjects as mothercraft, health knowledge, the healthy baby and home nursing and letter writing. There were also opportunities for fathers to take part with certificates awarded to things like shoe mending and simple carpentry, and there was also a section for brothers and sisters. The keeping of the clinic records was also judged. Eton Wick always seemed to do well, usually gaining several certificates and being placed third in the County Competitions of 1928 and 1931 and second in 1930. The highlight of the Annual Picnic tea, held in the garden of one of the boys' houses at Eton College, was the exhibition of competition work and the presentation of prizes and certificates. The College masters' wives put a lot of work into making these picnics enjoyable and memorable occasions. At Christmas time there was always a party (or Treat as it was known) with a Christmas tree and presents. In 1920 each baby and infant was presented with a pair of woollen slippers and a soap baby, and prizes were awarded to the mothers with the best records of attendance. 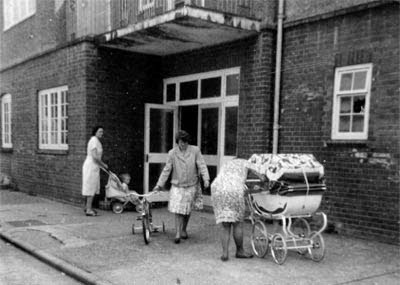 By 1926 the Babies' Welcome had become known as the 'Welfare', this being the name commonly used up and down the country where Infant Welfare Centres were now well established. However, the pattern of the meetings and social events continued until the National Health Service came into being in 1948.